This is a Jan. 3 column by San Francisco Archbishop Salvatore J. Cordileone from the Catholic San Francisco, archdiocesan newspaper. He is writing here to the Gentile Christians at Ephesus who had been “excluded” from the people of God, since they were not members of the chosen people of Israel. But now God has revealed himself to all people and given all nations access to membership in the people of God through the sacrifice of his son Jesus Christ on the cross. Therefore, whereas before the Ephesians had been “far off” from the people of God, now they have been “brought near” because they have accepted this revelation and regulated their lives accordingly. That was 15 years ago. I was a new bishop at the time, and felt very inspired by the bold and creative pastoral vision of my elders in the episcopacy, a vision whose impetus came from a meeting of the Catholic bishops of the dioceses along the border between Mexico and Texas. In the year 2000, they wrote a letter to the presidents of the Mexican and U.S. conferences of Catholic bishops expressing their concern for the loss of life and destruction of family life resulting from existing immigration policies and practices. 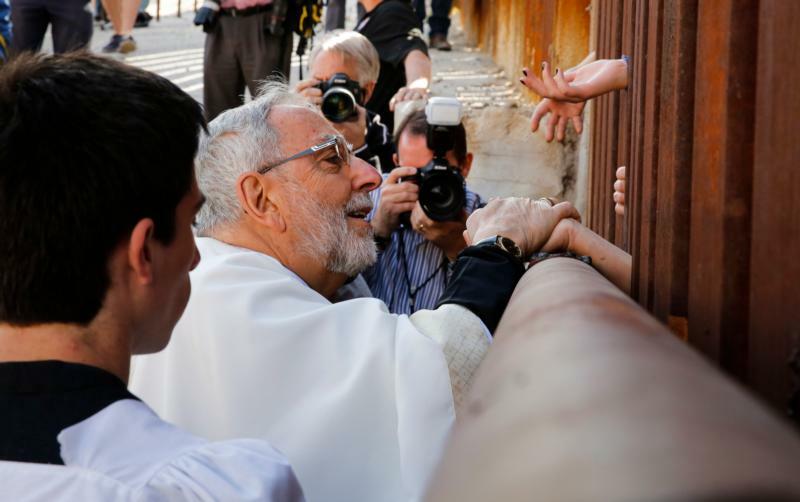 For myself, ministering in another border diocese at the time, San Diego, I saw up close the need for immigration reform and the human tragedy that results from our failure to achieve it. In fact, one of the first pastoral invitations I received as an auxiliary bishop was to celebrate Mass in a cemetery in the Imperial Valley for those buried there. The graves were unmarked. They had to be. The cemetery was for those who had died trying to enter the United States through the desert. Their bodies were found, unidentified. There were over 200 such victims buried in that cemetery at the time. For almost 50 years now, the Catholic Church in the United States has celebrated National Migration Week, which is being celebrated Jan. 7-14 this year. This week is an opportunity the church gives us to reflect on the harsh circumstances faced by migrants of all types, such as immigrants, refugees, unaccompanied minors and other children and victims and survivors of human trafficking. It is a reminder to all of us of the duty incumbent upon us as Christians to take responsibility for those suffering from our broken immigration system for, as St. John Paul II reminds us in his encyclical “The Gospel of Life,” yes, we are all our brother’s and sister’s keeper. I would therefore ask our Catholic people to do two things to honor National Migration Week: that is, two things to do not for or during National Migration week, but to do in order to apply the meaning of this week to their lives throughout the year. First of all, for those not already well versed in the church’s teaching on migration, I would ask that they become so. While it is true that some policy decisions fall within the area of prudential judgments, there are also basic moral principles that must always be respected if justice for migrants, and the countries they are seeking to enter, is to be attained. It is important that our people understand what our church teaches on this critical and timely topic, which provides the rationale for the sorts of policies for which we advocate. A good starting point would be to obtain a copy of “Strangers No Longer” and give it a thorough reading. Other information is available on the USCCB immigration website, justiceforimmigrants.org. Secondly, this important body of church teaching must not remain in the head. Behind every immigrant story is a very real and moving, and sometimes tragic, human experience. Immigration is an issue which, perhaps more than any other, looks very different when one can put a human face to it. As Pope Francis has stated: “Each migrant has a name, a face and a story.” It is imperative that all people native to our country get to know immigrants and migrants and listen to their stories. Every one of us in this country has an immigration story somewhere in our families’ lineage, and so in justice we must not see the newly arrived immigrant in our midst as “the other” or, even worse, a statistic, but rather pay attention to and care for them. And as Christians, we have the even higher calling of welcoming the stranger as Christ himself, for he reveals himself to us through them: “I was … a stranger and you welcomed me” (Matthew 25:35).